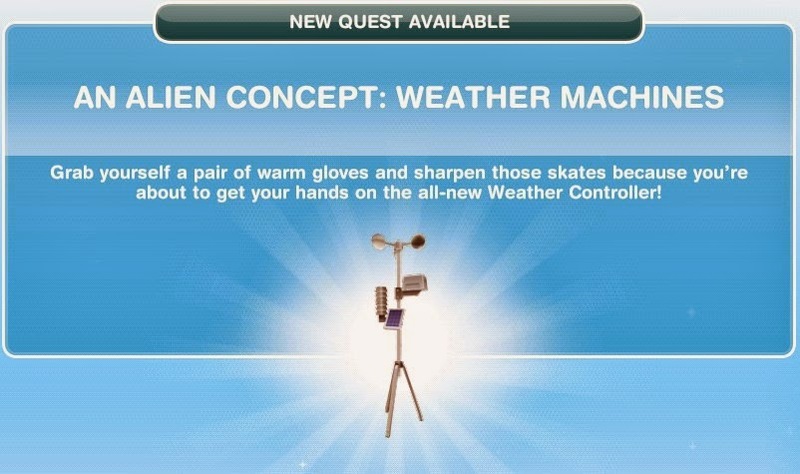 An Alien Concept: Weather Machines: Unlocked at Level 14 to gain access to the Weather Machine and Snow Park. This is a time-limited quest-line, you're given 2 days. Reward: Winter Clothing pack for the Costume & Swim Store on the Town Map and Winter Accessories for your Sims (accessible when you create a Sim or through a Wardrobe). (Available in Online Store if you did not finish in time). (How do I say this? Osiris is interested in seeing how Sims... show other Sims that they love them very much. 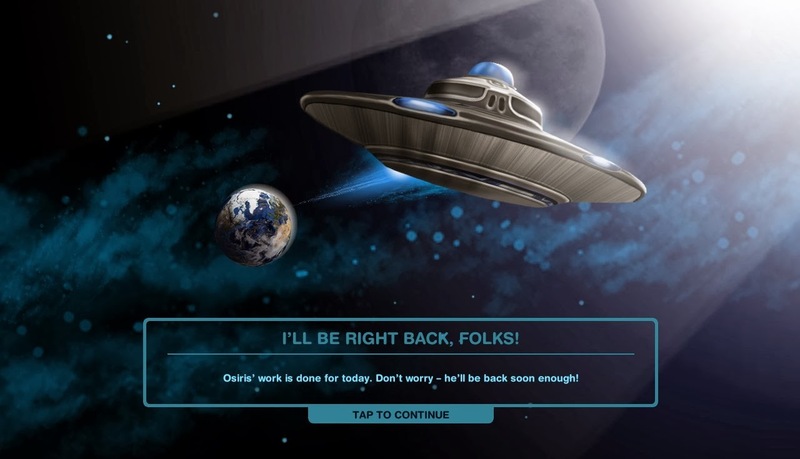 Hang on... surely it doesn’t want to watch your Sims woohoo!? 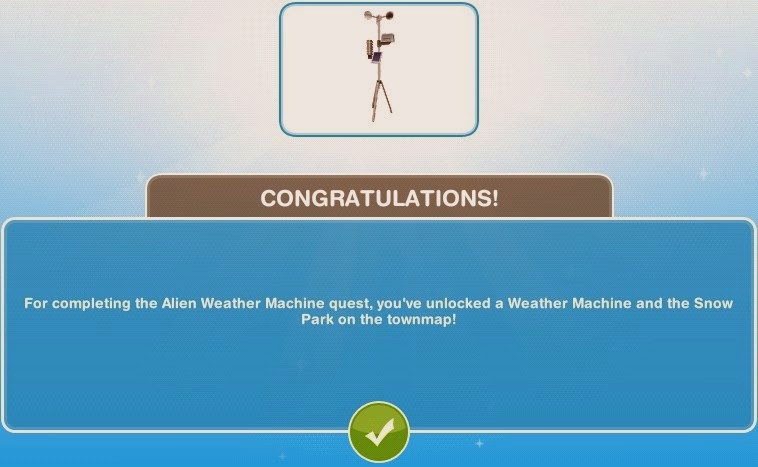 For completing the Alien Weather Machine quest, you've unlocked a Weather Machine and the Snow Park on the townmap! 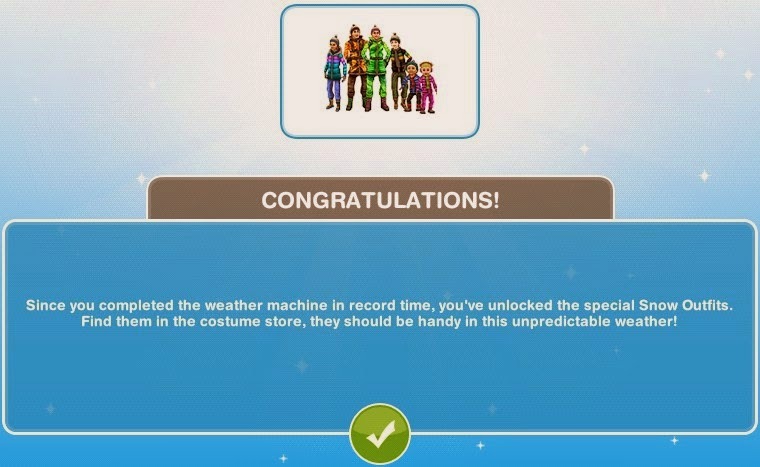 Since you completed the weather machine in record time, you've unlocked the special Snow Outfits. Find them in the costume store, they should be handy in this unpredictable weather! Please note: Make sure you build the Snow Park before you reach the Senior quest (unlocked at level 21). You'll need it then and if you need to build it during that quest, you'll run out of time.